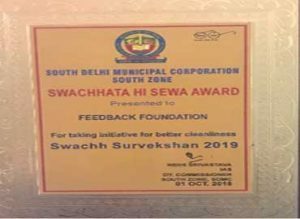 The South Delhi Municipal Corporation recognized Feedback Foundation’s exemplary performance and invaluable contribution in facilitating 5 slum areas in the zone to become Open Defecation Free on a sustainable basis. Smt. Meenakshi Lekhi, Member of Parliament and Smt. Nidhi Srivastava, Dy. Commissioner of SDMC gave the awards to the top 3 organizations in a special event held on 1st October 2018. The Foundation’s community engagement and collective behavior change approach was lauded by the Corporation.